Hypermobility spectrum disorders (HSD) are a group of conditions related to joint hypermobility (JH). HSD are intended to be diagnosed after other possible answers are excluded, such as any of the Ehlers-Danlos syndromes (EDS) including hypermobile EDS (hEDS). HSD, just like hEDS, can have significant effects on our health. Whatever the problems that arise, whatever the diagnosis, it is important that these effects are managed appropriately and that each person is treated as an individual. HSD and hEDS can be equal in severity, but more importantly, both need similar management, validation, and care. Joint hypermobility is a term to describe the capability of joints to move beyond normal limits. It can exist by itself or be a part of a more complex diagnosis. Those with joint hypermobility in a couple of joints (fewer than five) have localized joint hypermobility (LJH). Those of us with joint hypermobility in five or more joints are described as having generalized joint hypermobility (GJH). Unlike LJH, GJH is more often something we’re born with and possibly inherited, although acquired forms of GJH exist (training such as dance, widespread inflammatory or degenerative diseases of the joints, musculoskeletal tissues, and nerves, and hypothyroidism and other endocrine disorders). There are other types of JH. Peripheral joint hypermobility is a form of that affects the hands and/or feet only. It is common in infants, toddlers, and children, in whom it is usually mild or has no serious effect. Another is proposed for older adults who have progressively lost JH, called historical joint hypermobility. Joint hypermobility ranges from asymptomatic JH and GJH through to hEDS as part of the EDS. Along that continuum fall localized general spectrum disorder (L-HSD), peripheral hypermobility spectrum disorder (P-HSD), historical hypermobility spectrum disorder (H-HSD), and generalized hypermobility spectrum disorder (G-HSD). Generalized (joint) HSD (G-HSD): GJH objectively assessed (e.g., by the Beighton score) plus one or more secondary musculoskeletal manifestations identified below. The pattern and severity of the musculoskeletal involvement should be carefully assessed in order to explore the possibility full-blown hEDS. Peripheral (joint) HSD (P-HSD): JH limited to hands and feet plus one or more secondary musculoskeletal manifestations. Localized (joint) HSD (L-HSD): JH at single joints or group of joints plus one or more secondary musculoskeletal manifestations regionally related to the hypermobile joint(s). Historical (joint) HSD (H-HSD): self-reported (historical) GJH with negative Beighton score plus one or more secondary musculoskeletal manifestations. Physical examination aimed at excluding the alternative diagnoses of G-HSD, P-HSD, and L-HSD as well as other rheumatologic conditions is mandatory. Joint hypermobility can be symptomless apart from the unusual mobility, but there is a series of other symptoms that result from that mobility. These should be evaluated for a diagnosis of HSD (and treated, of course). Macrotrauma includes dislocation, subluxations, and connected soft tissue damage (ligaments, tendons, muscles). It can cause acute pain and loss of joint function. Microtrauma are injuries too small for them to be noticed as they happen. Over time, they may make one susceptible to recurrent or persistent pain, and possibly early joint degeneration like osteoarthritis. Occasional, recurring pain is a natural result of the trauma, but chronic pain can develop—perhaps because of unusual sensitivity to pain (hyperalgesia), perhaps because of an impaired connective tissue function (as suggested by the discovery of small fiber neuropathy in adults with classical, hypermobile, and vascular EDS). Proprioception—the sense of the relative position of parts of the body and how much effort is needed for movement—can be reduced. Not understanding where our joints are and how much muscle strength it takes to use them can lead to a cycle that increasingly limits our abilities to manage every day life. Those with GJH often have other minor musculoskeletal physical traits, which may be the result of the interactions between “softer” musculoskeletal tissues and mechanical forces during growth. These include flat feet (flexible type), misaligned bones in the elbow and big toes, mild to moderate scoliosis (side to side curvature of the spine), kyphosis (outward curvature) of the upper spine and lordosis (inner curvature) of the lower spine. There may be an indirect association with mild reduced bone mass as a result of many factors—lack of proprioception, muscle weakness, and the resulting reduced activity. 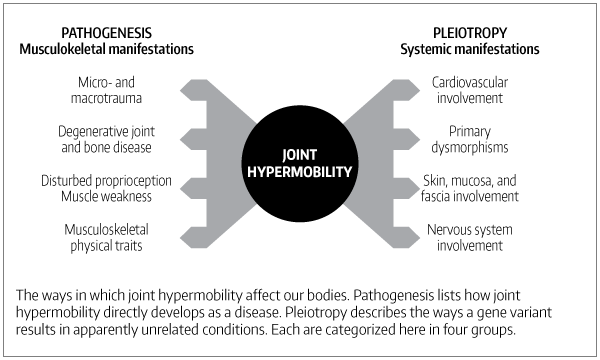 There are quite a few issues that are not the direct result of the mechanics of joint hypermobility. These associations are very real; they seriously affect quality of life and they need to be managed as part of treatment. The strongest (but not only) associations noted so far are anxiety disorders, orthostatic tachycardia, a variety of functional gastrointestinal disorders, and pelvic and bladder dysfunction. These additional problems need to be evaluated and treated when an HSD is diagnosed.